US stocks sank late Friday amid concerns about US trade policy. The 5.9% drop in the S&P 500 over the week was the worst in more than two years. Financial stocks were the worst performers on Friday. 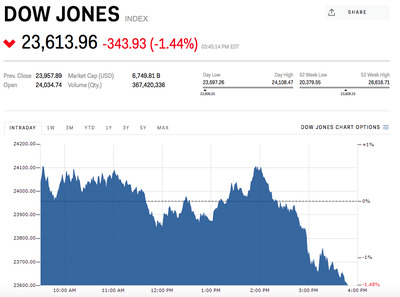 US stocks sank in trading on Friday afternoon, pushing the S&P 500 to its biggest weekly decline in two years amid concerns about US trade policy and retaliation from China. The Dow Jones industrial average fell 360 points, or 1.5%, to its lowest level since November 22. The S&P 500 fell 56 points, or 2.13%, while the Nasdaq fell 148 points, or 2.23%. On Thursday, China announced planned to impose reciprocal tariffs on 128 US products that had an import value of about $US3 billion last year. US President Donald Trump had earlier announced new tariffs on $US50 billion worth of Chinese goods, with the aim of reducing the $US375 billion trade deficit the US has with China. The financials sector was the biggest loser among the 11 on the S&P 500. On the Dow, Boeing and Nike were the only stocks in positive territory. The drop on Friday pushed the S&P 500 9% below its peak in late January, just short of the 10% threshold at which the index enters a correction. Meanwhile, Dropbox soared during its trading debut. Shares of the cloud-computing company gained by as much as 44% in trading amid the broader market’s weakness. Treasurys rose slightly, with the 10-year yield up by less than 1 basis point, at 2.823%.